While I was entertaining myself out and about with the delicious creativity of the Carioca contemporary cuisine, my kids were in love with the daily black beans with rice. 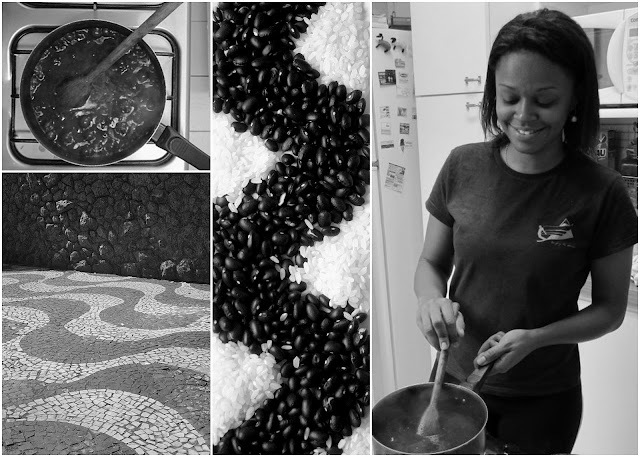 Although I've been cooking beans on a frequent basis for more than ten years while not living in Brazil, I thought it was time for me to go and learn a bit more about it. For that mission, I invited Lu, our family cook, to teach me how to make that delicious stew in no time. Normally I make it with a bit of planning, because up to this last visit, I was a believer that I had to soak the beans overnight. Black beans with rice is a national favorite, with international projection, and for generations it has been considered the core of kids' nutrition in my home country. My mom was the one who suggested I look further into the science behind the mix: Recently it has been discovered that the combination of black beans and rice is a winner. According to a study by the department of nutrition of Unesp, the combination of two amino acids in both foods optimizes absorption, great for tissue repair and with the perfect glycemic index. Embrapa, the Brazilian agricultural research agency, found that the best ratio to have all benefits from the mix is 2 parts black beans to 1 part rice. Another study found that black beans have a wonderful amount of fluoride, which benefits dental health. Back to the kitchen: Besides the unique flavor that Lu adds to her black beans "formula," she was happy to reveal to me that 30 minutes in the pressure cook would be enough for the beans to get the right al dente texture and, better than that, the best flavor. If you want to get more familiar with the pressure cooker, you can read more about it here. I adapted her recipe for an even faster recipe and if you are willing to try it, there's a good chance you, and most importantly, your kids will love it. Use your favorite type of rice to eat with the beans. To make it even faster, use two cans of black beans. I've read that beans retain a lot of their nutritional properties when canned. Trader Joe's black beans, for example, have 45 percent of the recommended daily amount of iron and 6 grams of protein; the dry beans have 8 grams of protein. I do use canned beans when I have a emergency. Sometimes canned black beans are easier to find than dried beans, which usually are available in the Mexican section of California supermarkets. Shallow-fry half of the beans with onion and garlic over medium heat for about 5 minutes. Add some of the cooking water to the beans and your desired amount of salt, and crush some of the beans with a ladle or wooden spoon to have a creamy sauce. You can freeze the remaining seasoned beans with some cooking water for the next time, so you'll just need to do the second step. Serve beans hot over your favorite rice. If you ask my kids what treat they most enjoyed to eat during our vacation in Rio de Janeiro, they will not hesitate to tell you: brigadeiros. To be more precise: what they call "brigadeiro pudding," the one served in a cup. The traditional Brazilian birthday party staple is now found in many shapes, and is sold everywhere: from little cafés to gourmet restaurants and even in a store that sells just brigadeiros in lots of flavors. The latest trend is to serve brigadeiros in a cup, and you can find them with different chocolate sprinkles and flavors. I read many versions of its origin, and found this to be a sort of good one, found in Wilkipedia: Brigadeiros were named after Brigadeiro (Brigadier) Eduardo Gomes, who ran for Brazilian presidential elections in 1945 and 1950. The sweet was made for the candidate's fundraising parties, and became very popular and was nicknamed after him. But few people might know about this. Maybe Brigadeiro — who never got elected and was present in many chapters of the politics of the military era — would be surprised about his unknown popularity nowadays. But why is brigadeiro so popular? The fudge-like texture is always there, sometimes silkier, sometimes a bit chewy, but always very sweet and melting in the mouth. It made me remember when I first posted about brigadeiros here, covering them with grated Belgium chocolate. At a birthday party last Friday, grown-ups and kids could not resist to ask to take some brigadeiros home, as an improvised goody bag from the party and a sweet goodbye to our wonderful days in Rio. This recipe is very basic, but the main difference is the time for the reduction of the condensed milk with chocolate. The intensity of the chocolate taste can be defined by the type of chocolate used in the mix. Some gourmet versions use grated dark chocolate, added when the mix is already hot. Some people use fresh heavy cream to finish the process, adding more of a smooth texture (and fat) to the mix, but traditionally this is the main recipe, and you can play with it as you like. Melt butter in a heavy-bottomed pan over low to medium heat, then add condensed milk and chocolate. Use a wooden spoon to stir constantly. When mix is looking even and smooth and not yet sticking out of the pan, remove from the heat — that would be around 9 minutes on the stove. Let the mix cool down a little bit, then spoon into mini cups and cover with your favorite topping. To achieve a firmer texture and roll them, cook the mixture for a few more minutes until it starts to stick from bottom of pan. Let cool, then roll into balls. 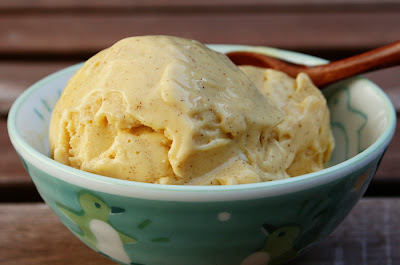 Smooth, rich-tasting, and low-guilt ice cream is my holy grail of sweets. Most desserts I don't bother trying to healthy up — there's little point. But ice cream is one of my great weaknesses, and something I've had to cut back on as the years pass. I've experimented with all sorts of low-fat and low-cholesterol ice creams with mixed results. This tropical version, blending coconut milk and yogurt, is one of my favorites. Non-fat, Greek-style yogurt has been finding its way into more and more of my dishes lately. It brings creamy goodness without fat and adds a good dose of protein — especially helpful with my kids in an extremely picky phase when it comes to food. Light coconut milk blends in beautifully for a rich-tasting frozen treat without a drop of cream. This only uses part of a can of coconut milk; try using the rest to make Lemongrass-Coconut Tomatillo Sauce or a Coconut Frappé. I kept this tropical with an infusion of mango and cinnamon, but you could substitute any seasonal fruit you like. Rather than chill after mixing, I put the mangoes and a can of coconut milk into the refrigerator the night before making it. I prefer unsweetened coconut, but you can use whatever you like. Combine all ingredients except coconut in a medium bowl and whisk until smooth. Chill at least 1 hour. 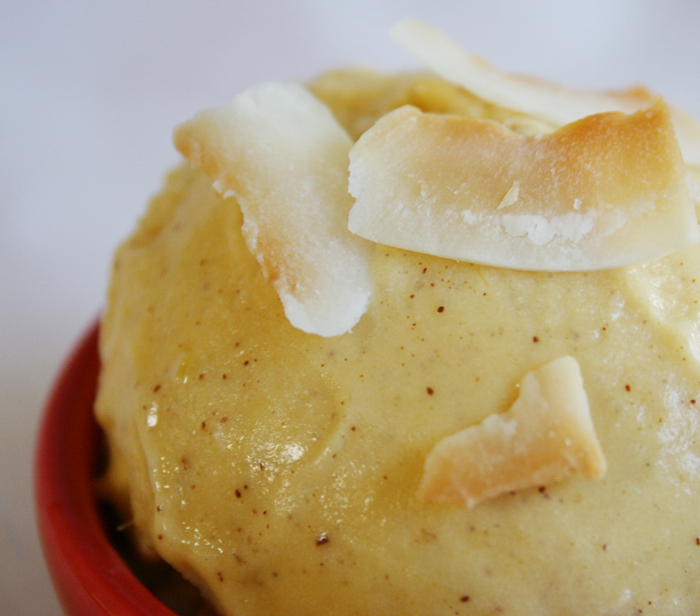 Stir in 1/2 cup of coconut, if using, then pour into ice cream maker and process according to manufacturer’s directions. Serve garnished with remaining toasted coconut, if using. One of the new additions to my garden this year is a tomatillo plant. I plunked it in the dirt with no idea what I'd do with it; I just liked the green fruits wrapped in papery husks, like little gifts. We recently returned from a tropical vacation to find ripe tomatillos showering down, so it was time to figure out how to use them. Reluctant to let go of vacation too quickly, I decided to try them with lemongrass and a bit of coconut. 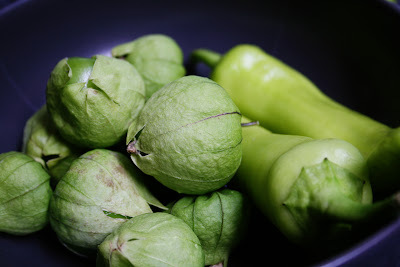 Tomatillos look like green tomatoes, beneath their husks, but they taste nothing like them. These are the green goods for salsa verde, which is essentially what I made — but with a healthy infusion of Pacific Islands flavor. A good tomatillo fills out its husk nicely. They start out bright green and tart, and gradually turn yellow and mellow. My plant is turning out tiny tomatillos, about an inch across. You'll find much larger ones at the market. You can use them raw, roasted, or cooked; here, I boiled them briefly to make them a little less punchy. We threw in an Anaheim chile harvested at our school garden, lemon verbena from the front yard, and a bit of juice. The result: Wow. 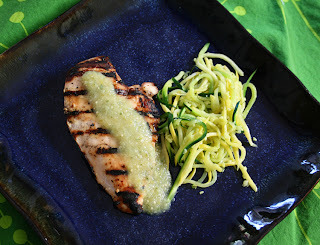 The tart-sweet, light sauce saved our otherwise unremarkable chicken and guarantees space for tomatillos in next year's garden. Use fresh lemongrass if you can find it (try well-stocked stores or Asian markets): Cut off the bottom stem and top leaves so you have only 4 or 5 inches of stalk, then peel off and discard the tough outer layers. If you don't have lemon verbena, try lemon balm, cilantro, or lemon basil. You might want to throw in a jalapeño for a bit of heat. You can freeze the sauce without the coconut milk; blend in the coconut milk after heating the thawed sauce. Husk tomatillos and wash to remove the sticky residue. 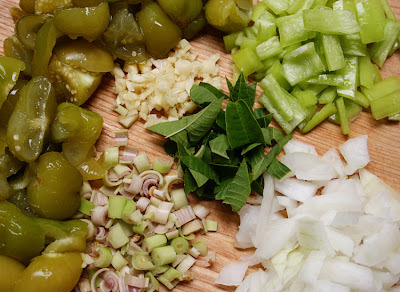 Bring a pot of water to a boil, add tomatillos, and simmer for 5 minutes. Drain and coarsely chop. Combine tomatillos and remaining ingredients in a food processor or blender and puree. Serve with grilled chicken, fish, rice, or vegetables.